This year Vijaya Dasami is on 6.10.11, on the ninth day of Navrathri. Last year I posted about the way this festival is celebrated particularly in Andhra Pradesh, in Hyderabad region. 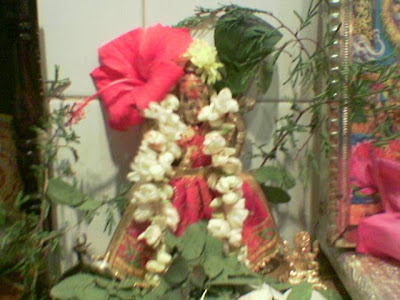 As Mahalaxmi pujai is considered auspicious to be performed on Dasami day, I wish those who can get the leaves (Jembi) keep them ready and perform Ashtothara Archana to Goddess Laxmi on Vijaya Dasami day, and offer Rassaanam as prasadam for dasami for Annai, along with other festival menu. Muthaarathi is taken in the evening to Devi(Durga,laxmi and saraswathi) to mark the end of nine day pujai. Golu bommai can also be moved that night along with kalasam (if placed). On Durgaashtami day doopam in the evening is offered to Goddess. Normally Naar doopam (coconut coir) is preferred. 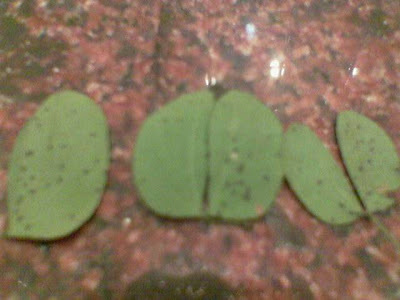 I am posting the picture of the 'Jembi' leaf and also the stem with which I performed pujai. I dont know the botanical name of the leaf. It is beleived that the Pandavas kept their weapons under this tree and Vijaya Dasami marks the celebrations of the victory of the war. The leaf is considered as Gold and in Telengana they greet each other giving this leaf - calling it " Bangaram". This is really a rare leaf sold just a day before and as precious as Gold now. I am happy and proud to follow and know more about our tradition. I am sure by sharing we can unveil the in-depth meaning behind every custom followed in our culture. Let us all seek the blessings of all the three Ichaa sakthi, Kriyaa sakthi and Gyana sakthi aspects of Devine feminity and have all round success in our lives by praying nine days and also on Dasami day, Devi in Sivasakthi roopam symbolising the sakthi as MAHASAKTHI.